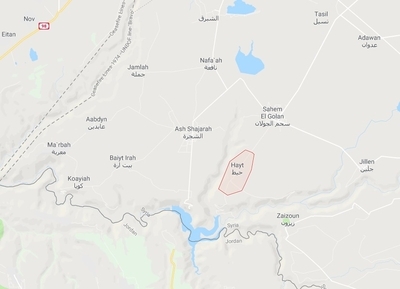 Heet in the wider area of southwest Deraa. Sahm al-Jowlan to the northeast and the various localities to the west of Heet are controlled by Jaysh Khalid bin al-Waleed. Note in particular that Farqat al-Haqq joined the Jaysh al-Thawra alliance in March 2018. In addition, a number of factions besides those listed have provided logistical and material support for the operations room, including Liwa Fursan al-Jowlan (a faction known to be supported by Israel), Alwiyat al-Furqan, Farqat Ahrar Nawa and Liwa al-Izz. 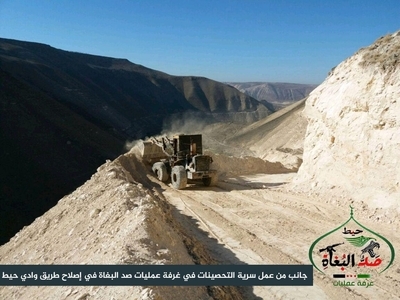 Photo released by Sadd al-Bagha operations room in December 2017 showing the work of the operation room's fortifications squadron on repairing the Heet valley road. Conversely, a number of people from Heet have joined Jaysh Khalid bin al-Waleed. In total (including those who have been killed), that number comes to 20-30 people. That said, an interesting twist occurred recently with the defection of one Abu al-Bara' Heet from Jaysh Khalid bin al-Waleed. 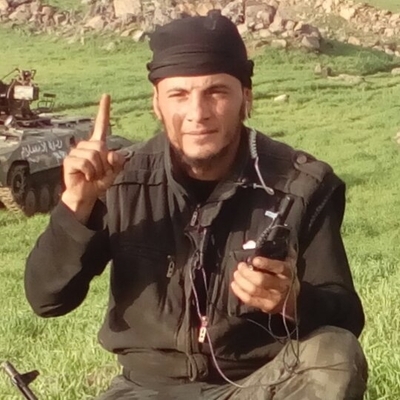 Abu Waheed al-Heetawi was a Jaysh Khalid bin al-Waleed fighter from Heet who was killed almost a year ago. His real name was Muhammad Waheed al-Jaghini and he was born in 1990-1991. His father, who still lives in Heet, owns a vegetable shop. Like many people in Heet, Abu Waheed worked in agriculture. With the onset of the civil war, he is not known to have joined any faction prior to Jaysh Khalid bin al-Waleed and its predecessors. Indeed, the first faction he joined was Liwa Shuhada' al-Yarmouk in early 2015 or mid-2015. By this point, there had already been clashes between Liwa Shuhada' al-Yarmouk and Jabhat al-Nusra, which correctly accused the former of having links with the Islamic State. Despite Liwa Shuhada' al-Yarmouk's formal denial of links with the Islamic State, by 2015 many supporters of the Islamic State in the south would have known of the group's Islamic State affinities, which were displayed more openly following the initial clashes with Jabhat al-Nusra at the end of 2014. Abu Waheed al-Heetawi. Note the vehicle behind him marked with the writing "Islamic State." It is alleged that Abu Waheed was facilitating the entry of people into the Yarmouk Basin area in order for them to join Liwa Shuhada' al-Yarmouk, and thus he ended up joining the group as well. Before he got involved with Liwa Shuhada' al-Yarmouk, there were no clear signs of his sympathies with the group and the Islamic State. One source from Heet said that he concealed his sympathies. Neither his parents nor his siblings made the journey with him to join Liwa Shuhada' al-Yarmouk. As for Abu Waheed's wife, she apparently stayed behind in Heet at first but later joined him in the Yarmouk Basin. 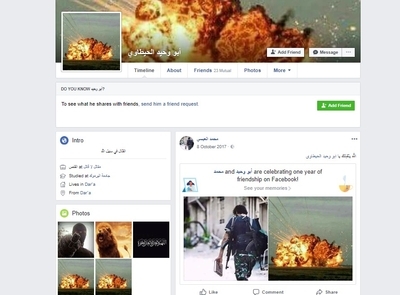 A Facebook profile of Abu Waheed al-Heetawi, including a post from another user on 8 October 2017 asking for God to "accept" Abu Waheed, indicating that Abu Waheed is dead. Within Jaysh Khalid bin al-Waleed, Abu Waheed's role was operating a BMP vehicle (cf. Abu Waheed's apparent interest in tanks). He was killed in a battle known as the "Battle of Eid," referring to a failed attempt by Jaysh Khalid bin al-Waleed to assault Heet during Eid al-Fitr in 2017. I myself only had one unremarkable exchange with Abu Waheed on Facebook.